It is on sale in Australia and comes with gravel, water and a live fish. It has a built in speaker at the bottom and a headphone jack. 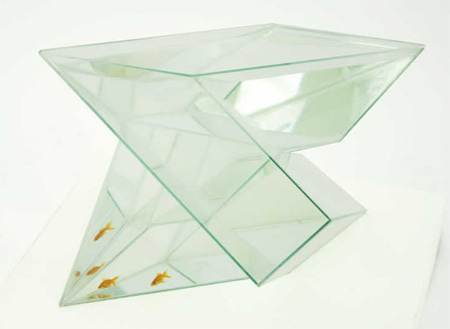 The repetitive geometrical shape of Infinity aquarium creates a visual metaphor to life in the fish bowl. Hand crafted from cut glass, Infinity aquarium scales down a vast concept of time and space. 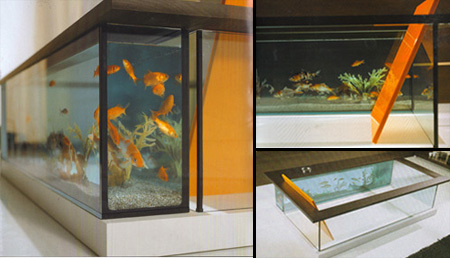 Innovative liquid luxury – aquarium built-in into coffee table. This modern bathtub with built-in aquarium will surely spice up your bathroom. 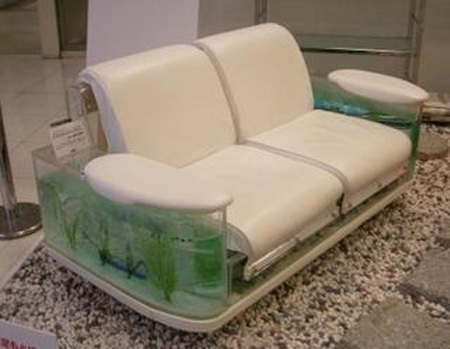 Priced at just $12,000, his sofa features aquariums on both sides. Canadian company called Aquarium ASP has created the Spacearium, a thin, hanging aquarium that be used as a room divider, lighting element, or for good old fashioned decoration. The MILK desk comes with a built-in fish tank option that gives you a place to rest your eyes and provides a touch of daily nature. 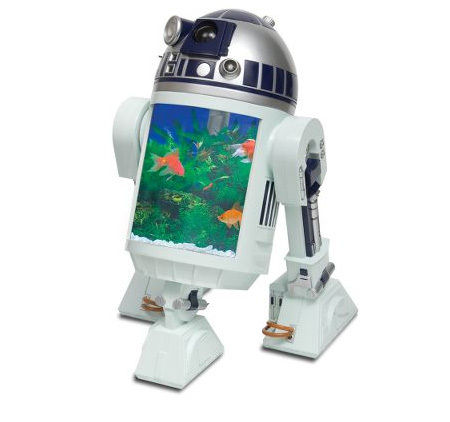 Modeled after the most well-known astromech droid in the galaxy, this R2-D2 holds a 1 3/4-gallon aquarium tank in his central compartment. 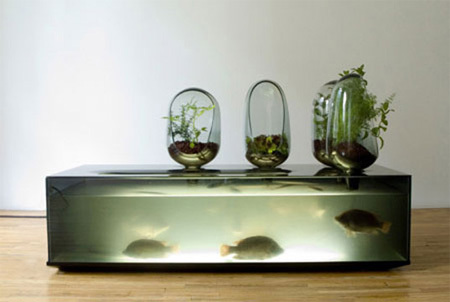 Beautiful aquarium by Mathieu Lehanneur breeds freshwater fish and vegetables. The vegetables strip minerals and nitrates from the water, effectively purifying it for the development of the fish. 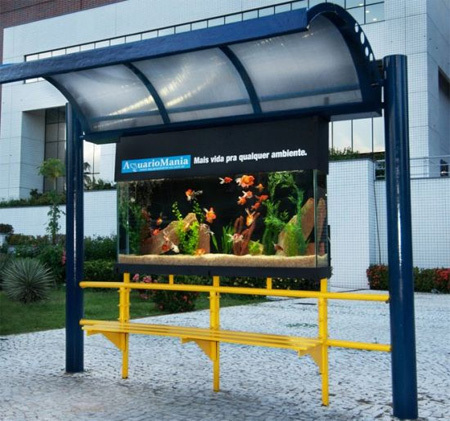 This bus stop is a real design from Brazil, dubbed “AqurioMania”. Moody Aquarium Sink will spice up boring routines such as washing hands and brushing teeth. 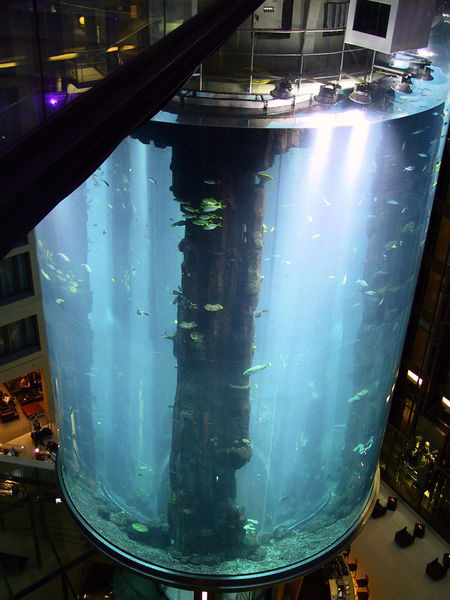 The AquaDom in Berlin, Germany, is a 25 meter tall cylindrical acrylic glass aquarium with built-in transparent elevator. Ever wondered what to do with that ancient 26″ wooden TV set laying around in your grandparent’s garage? Turn it into a unique aquarium. 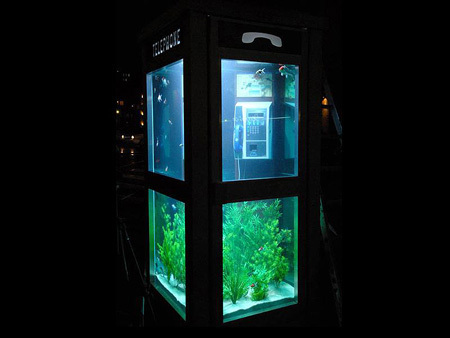 Benedetto Bufalino and Benoit Deseille have transformed a regular telephone booth into a functioning aquarium. That iPond one was heavily criticized when it first came out as being cruel to the fish. It was pulled from shelves at some places. I bet some of these are annoying to clean! I love these, the old TV and the sink I would have in my house, lol! Infinity and the bus stop are great too! Are those snakes in the local river one?! the iPond would make a good iPhone app using the camera. I love the sink one, although it might be a bit freaky when cooking. Am afraid my house would be a bit small for the 25M one. Oh my god, these a beautiful! the river-plant one is a great concept. there’s actually waste-water treatment plants that work that way. never thought of it decoratively, but it would be real nice. i’d probably try and put more plants on there, and more stuff inside. make the whole thing more happy looking. Cruelty never looked so beautiful! AquaDom is absolutely… can’t find words. Check out videos on youtube! Poor fish on the ipond one the fish and even move! I love it and i come back! the Local River pond and the Aquadom is fantastic! i loved the ipond aquarium. 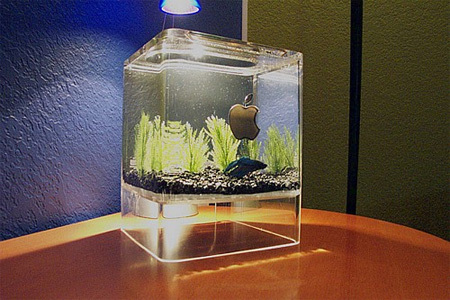 i really really really want the ipond for my birthday or for christmas its so awesome. i hope i can get one really really soon. That iPond is disgusting. What is the point? Even the designing is off. The poor fish, imagine being cooped up in a cage twice your size for your (I imagine) very short life. RSPCA anyone?? I love the Coffee Table .If my friends see it ,they’ll be …. I loved the bathroom sink and coffee table designs the best but they all cost a fortune! 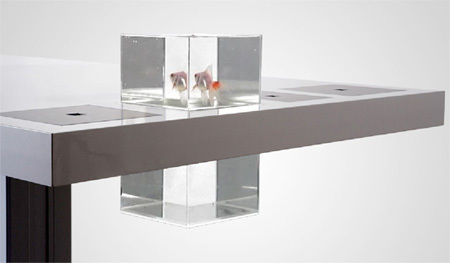 the bathroom sink aquarium is for $4000-as much as a pro nikon camera and lens kit! Way too much expensive. Some of those are pretty awesome. I really like the sink idea, but it seems completely impractical to me. The running water intermittently hitting against the glass would probably be really hard on the fish. Same thing with the coffee table. “Don’t tap on the glass”, anyone? I would totally use the desk one and the spaceariums, though. Practical and beautiful. The iPond is idiotic. Why does everyone insist on keeping betas in containers that are only six inches across? The idea that they will die if kept in a large space is a bloody myth, people! Beta bowls are cruel. I agree. Some of these ideas are simply evil. I would be PISSED if I had to spend my life chillen in a 6 by 6 inch cube. Although, if I had to live in that sofa, I could still watch NFL games….. The Infinity one is beautiful, but looks wicked tough to clean….. I love that Spacearium Aquariums. It is amazing look . Very nice collections this is…. the sink and sofa and telephone both and the aquadom is all awesome (Y) . Typical of humans, torturing animals to amuse ourselves. I love that it’s assumed that the animals are tortured. if people are willing to spend so much money buying these unique aquariums i think they’re going to take good care of the fish. No matter how well animals are taken care of, putting a living creature, designed to move or fly around an unlimited space, depriving it of its freedom and confining it to prison for having done nothing wrong is the cruellest torture that only human being is capable of. Those who think animals in any kind of captivity are happy should imagine themselves in their place — in a small cage, well-fed and clean, gawked at by passersby and think if they would enjoy it. prpceolc: Someone who knows how to properly take care of fish knows that the smaller the aquarium, the more DIFFICULT it is to clean properly. A 1G bowl should be cleaned every other day. But the people who own 1G bowls are those who know the least about fish and are not suited to that high level maintenance. Even if someone does clean the bowl twice a day, cleaning a tank that often stresses the fish anyway. Despite stupid myths perpetuated by the pet industry to make quick sales, bettas do not live in puddles, and the only reason they can survive in the equivalent for more than two days is because bettas have a labrynth organ that enables them to survive bad water quality for SHORT periods of time which they developed to cope with their native dry seasons. therefore, in a bowl a betta’s lifespan is much, much shorter. A betta kept in the right conditions should be able to live 3-5 years, and some are even reported to live up to 7 years. Has anyone ever kept a goldfish in a bowl? How long did it live? 6 months? a year? two years? A goldfish kept in a 10 gallon tank can live up to 10 years, and one kept in a good size pond can live up to 20 or 30 years. The oldest living recorded goldfish is 39 years old. No matter how well you keep the fish, one kept in anything less than 3 gallons will never be as healthy nor live as long as one kept in the appropriate filtered (and in case of a betta, heated) tank. Anthropomorphism, anyone? Just because a HUMAN would feel a certain way about something, PLEASE don’t assume a FISH would feel the same way—ESPECIALLY one that has probably been bred in captivity for YEARS. However, I must agree with Reyairia. I had a fancy gold in a 10gal tank for about 8 years before he died–I don’t know how old he was when I got him. No fish should be kept in any of these environments. i’ve seen one at underwater world in brisbane, australia, that was a car filled with fish! Hate the ipond. Not only is it cruel but impractical what do you do when the fish dies from starvation. Is that the real David Bellamy the botanist making a comment? If it is I’d agree with him because at least he has the credentials to know what hes taking about. Why is it that something as weird as the i-pond is attributed to coming from Australia? Is it because we are that far away no one is willing to check if it is bull…..? That item has NEVER been sold in Australia let alone “now removed from shelves”. I am a wholesale aquarium accessory dealer and you can be assured that the RSPCA would never allow such a thing to be sold and nor would any reputable person attempt to market it. I love the sink one lol. The Infinity Aquarium was the most amazing. I love it all !!! People stop being so stupid, it’s only fish. Us humans like to entertain ourselves. I wish I had the money to buy it all !It’s damn creative ! I like some of them but that iPond is really cruel. The fish can’t even move. 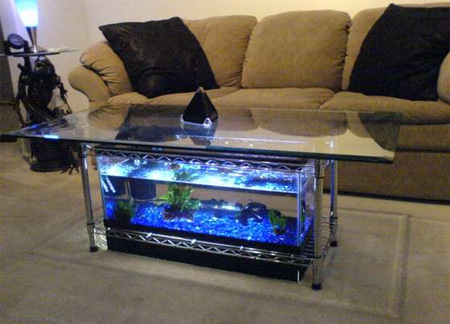 Why not give it a big tank the size of the coffee table? It gives it enough room to move around and live like a fish. I love the couch and sink I want one! so all of u who think that some of these are cruel and animals shud b free r basically saying that u dont hav pets? i sure at least a few of u hav a dog or bird or whatever so all of u haters hav to back off cuz it took people a long time to create these. i love animals and i hav fish. i dont think it’s cruel if u know how to take care of the animal. I think the only thing cruel on this post is the bathtub. Why should those innocent fish have to stare at my fat backside? They never did anything to me. even a betta in one of those tiny ipod things would be dead in days.can it even turn to face the other way?are animals so “throw away”in the name of “art”? AND they call it an aquarium! OMG people are strange and judgmental. the ipond is not mean. Do people not realize that the natural habitat of betas are puddles little tiny puddles that sometimes don’t even cover the whole fish. And when the puddle drys up the fish jump to another puddle. Stop being so judgmental. All of these tanks are neat and innovative. People commenting about the cruelty factor, need to read the comments already added, we are retracing old steps here people… Haha. The bath and the sink are terrible ideas. The constant hot water being used would change the temperature of the tank water and stress out and kill (depending on the breed of the fish and temperature of the water) the fish. They look pretty sweet, but would definately harm the poor little fellas inside. And the ipod tank isnt as cruel as alot of people are saying. Just as long as a betta has water in its gills, it can live for hours out of a tank. 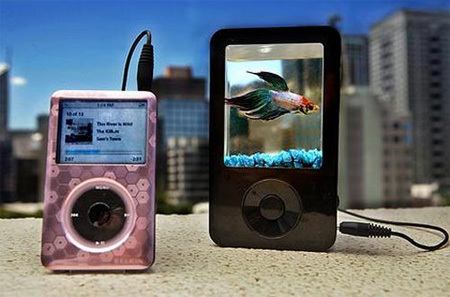 At your local fish store they’ll be selling them in small cups of water that hold LESS water then the ipod thing does. But in saying that, the fish inside the ipod would be miserable being stuck in that thing, so its not really that great of an idea. You keep an ipod in your pocket or bag, the fish has gota hate being shaken around so much when you walk! And the constant vibration from the speaker would stress it out to the max. Plus the water isnt heated and even though bettas can live in cold water, they really love warmer conditions. It looks like a photoshop anyway. Either that, or its dome shaped, which is just plain stupid. Im hopefully gona be building one soon! The phone booth looks incredible!! I love it! i love the talb tank that is aewsome!the tv and r2d2 tanks are cool to ! good gob:)but why would you guys have a toilt tank? 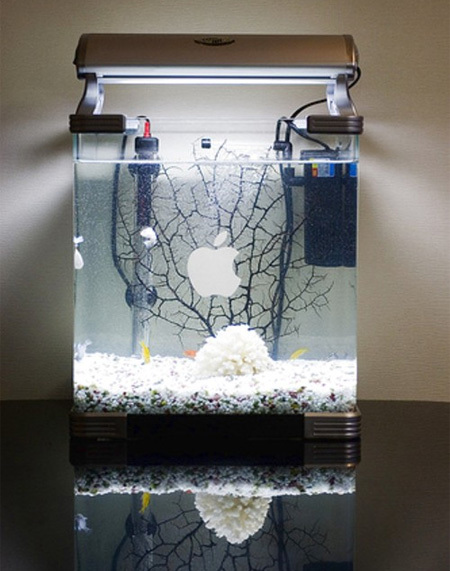 that would be wird but it is cool!i wish i could get that HUGE tank for my 5 fish ! they would love it!even though they are about the size of the top half of my finger and my finger is tiny. 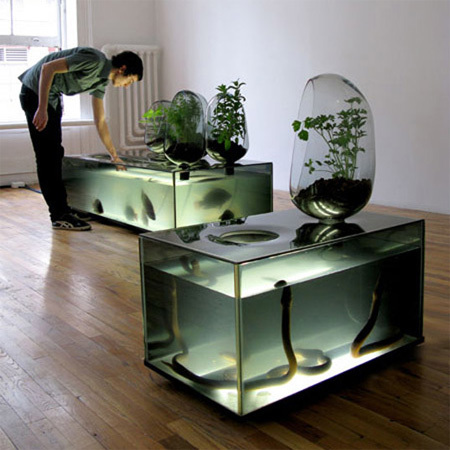 you guys got wird but cool fish tanks!what exeipired you guys to make such aewsome tank?! eventually, the aquadome hused 5 neon tetras! 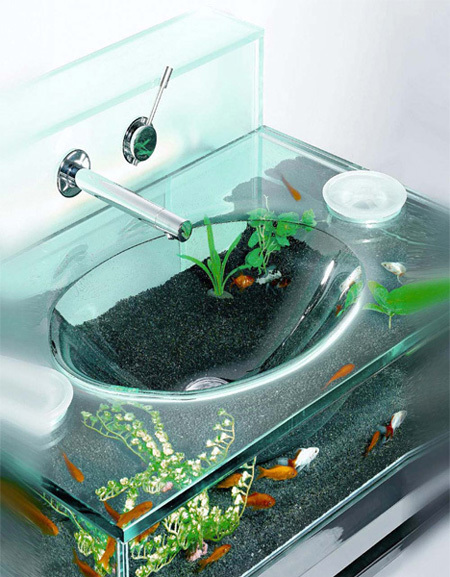 why in the world would you want a sink as a fish tank? that is so wird. i would not like to have my fish looking at me when i’m using the freaking toilt.what did they do to me. to torch theme so bad!? sofa one looks so difficult to change water. OMG my house is ganna be like im in a fish tank! p.s i agree with Aoi! ITS NOT CRUEL THEY DONT CARE. all they do is swim eat poop repeat over and over again and again! Fishes in aquariums, no matter how good they are kept, still they are kept in captivity. But, I think in this way, these animals are atleast kept in clean environment and taken care of. Think about the infinite number of fishes caught and mercilessly killed either to eat or just to throw. We cannot be very perfect. (Even god is not)So, keeping fishes in gud environment and making ambience lively should not be a problem. If they are free in wilderness, they are at constant danger (we have seen it on animal planet). Ok sorry to burst your bubble, but bettas have NEVER originated from puddles. They were first from rice paddies, which yes are shallow compared to a pond, but are always at least six inches deep. They have also been found in deep ditches, slow moving streams, and canals. Also, they are better off in a large aquarium, with at least two and a half gallons of water PER fish. They can survive in shallow water yes, but that doesn’t mean a puddle. It means large areas of shallow water. Fish also do have a memory. They can recognize their owners (or whoever feeds them regularly) and they can be trained. Siamese Fighting fish were trained to behave as they do. They already would fight for dominance and territory, but people further trained them to do so even more. Believe me on this, it is in fact cruel to keep any fish in such a small tank no matter how well kept it is. I know this because where I live my family still raises them in the paddies, and has for generations. I would never put my darling Noi in something like that. Is that snakes I see in the Local River Plant Aquarium? Ewwwww…Yuck…disgusting! I gotta agree with tiny tanks and bowls being cruel, makes me sick to see them being sold in stores in those kind of things :/ It’s retarded, really. What a life to never know what’s behind you. Wow, I love the sink. And, yes, there was a hole in it to feed the fish. And I’m sure the people who made these were smart enough to make holes for water to go out. They want to make decorations. And, yes, the ipond idea wasn’t the best, but maybe rhey made a hole to let the fish out. I’m sure no one would torture a fish like that. Old tv one very clever however would of prefered more viewing space. couch one awesome however not very practical. Sink one extremely intelligent however insure were the tap water would go. Love telephone both. Apple ones arent that great, if they were in the shape of a product (the ipod one!) it would be a lot better, nice idea though. 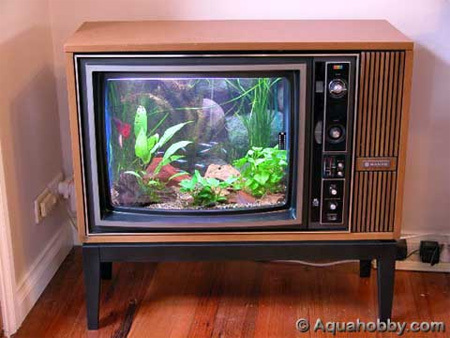 I like the old tv aquarium. excuse me,but fishes are the gift of god!!! they arent JUST fish,,, they are also a source of food and income!!! i know im too young (hello! !9 years old here!!! )but i appreciate gods gifts!!! and how do you feed the fishes anyway???uhh…hello??? ANIMAL CRUELTY!! !fishes should be taken care of…not abused!!! How on earth do you clean that Infinity tank? Goldfish can make any tank seriously messy! I want all of them! Great work, I love the TV one. How could I get one made? All I need to do now is win the lottery! How funny to find this site. I made the TV Tank in 2003 (and still in use now), and a little surprised to find this pic here. Thanks for the compliments guys. Fish are not wood to be owned as pets for your amusement. They are living beings which deserve to be free. The vast majority will not agree with this, kinda like during slavery the vast majority didn’t agree that blacks should have equal rights. The human race is very slow to be moral, it cares more about being entertained. HELLO PEOPLE WAKE UP!!! I have a Male Jumbo Melano Betta and I have managed to train it to be non aggresive but scared of anything that is not food that enters its tank, but still it loves to swim around its 10L tank. This proves that fish need a large environment to thrive and enjoy themselves in.THE IPOND IS THE WORST INVENTION TO EVER INCORPERATE MAN AND BEAST IN HISTORY!!!!!!!!! Most of these are only focusing on design detail and certainly NOT the poor fish involved. Personally, unless you have a very large tank (even then I’m not thrilled) keeping fish in tiny tanks is as cruel as keeping birds in cages. Sigh…humans will never learn. The I pod aquarium is cruel. Bettas were made to swim in huge rice patties. Not to live in tiny animal footprints or tiny aquariums. What is wrong with us?? ?